The integration of faith with learning is central to Christian education.1 In the online learning environment, successful implementation of this principle can pose a great challenge to educators. The geographic distance that separates teachers and students makes relationships less personal and hence more difficult to cultivate. Creating an online environment that nurtures faith depends on good relationships between teachers and students. As students gain more control of their own learning, they still need teachers to provide support and advice. As a result, teachers take on the role of “guide on the side,” providing help when necessary, but ultimately allowing students to discover on their own. While this type of relationship works well within the online environment as students learn independently, more intentionality is needed to nurture a strong faith presence in the online classroom so class designers must plan how to include learning experiences that support faith integration within each course. How can I be sure that my students prayed before they began the course module? Did my students read the opening prayer or devotional message and meditate on the Bible text I posted? Did the students observe, understand, and experience principles of Adventist education in my course? Will they be inspired to live a Christian life after exploring the lesson content? Were they inspired to engage in mission as a result of my class? In short, did they experience faith in their online class? Given the unique nature of online learning, there is indeed uncertainty regarding the impact of faith integration attempts in this modality. Using traditional IFL strategies does not guarantee attaining faith presence in an online class. Specific adaptations are needed to achieve this goal in the electronic setting. 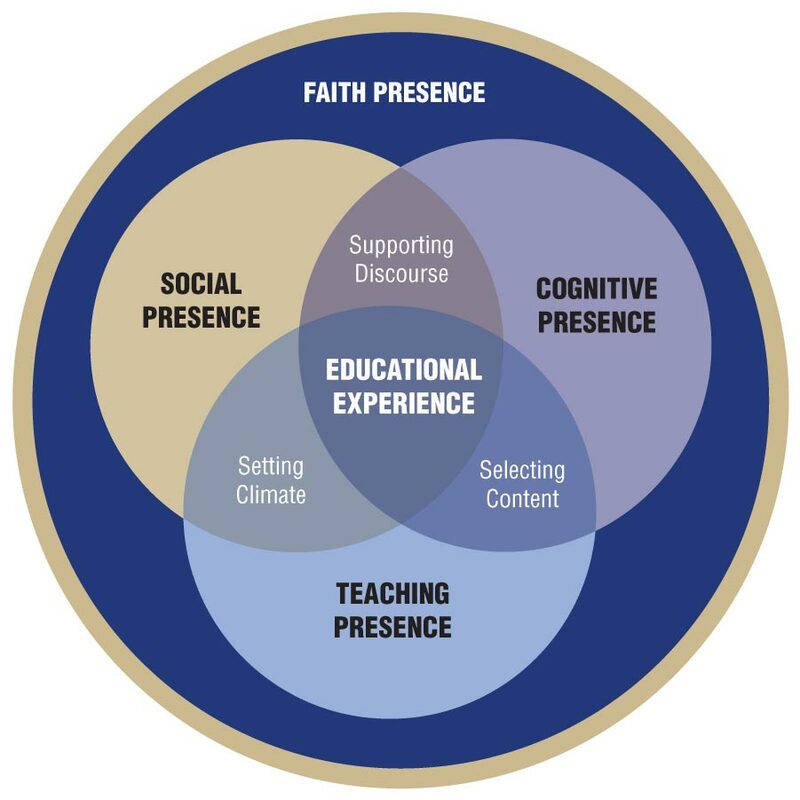 Faith presence, as a construct, was first conceived as an enhancement of the Community of Inquiry (CoI) approach2 to online education to enable CoI to address the faith integration needs of Christian education. The CoI model emerged out of a framework developed by D. Randy Garrison, Terry Anderson, and Walter Archer during a 1997-2001 Canadian Social Sciences and Humanities research project that studied the characteristics and qualities of learning with computer conferencing. Since that time, more than 2,500 publications, dissertations, research projects, and citations have solidified the framework as a model for the types of learning that take place in an online environment. The model posits that an educational experience consists of three key elements: cognitive presence, social presence, and teaching presence.3 The CoI model was adapted to include faith presence, and renamed the Integrated Community of Inquiry (ICoI) model.4 The ICoI model serves as the framework for online course design and planning at the Adventist Institute of Advanced Studies (AIIAS) in Silang, Cavite, Philippines. Faith presence, on the other hand, goes beyond mere alignment in terminology with the other three types of presence. It shares the model’s foundational belief that quality online learning happens within a critical community of learners where both personal meaning-making and social interaction are facilitated in the educational transaction. The CoI model describes a quality educational experience in an environment where the computer is used as a conferencing tool as the “dynamic integration of content and context created and facilitated by a discipline expert and pedagogically competent teacher.”6 Similarly, creating faith presence calls for the same level of personal engagement and meaning-making, even as we respond to the promptings of the Holy Spirit in creating a dynamic, nurturing community for learners. In Christian education, the concept of community, the connection of content and context, and the important role of the teacher are, likewise, emphasized, but from the perspective and belief that God designed human beings to be “relational, communicative, cultural, moral, expressive, meaning-makers such that to deprive them of a relationship is to de-humanize” them.7 The biblical foundation of this belief comes from Genesis 2:18 (NKJV),8 which says, “It is not good that man should be alone” and the apostle Paul’s description of the early Christian believers as the “body of Christ” (1 Corinthians 12:27) in referring to the interrelationship among them. Figure 1. Integrated Community of Inquiry Model. The existence of faith presence in an online class cannot be readily observed by just looking at the course Webpages, considering all the challenges to online education cited earlier. To fully understand how faith is nurtured in this modality requires input from actual participants. Twenty-one students in three fully online graduate-level classes in an Adventist higher education institution were asked, through in-depth structured interviews, to describe their experiences in terms of faith presence in their classes. The interviewers sought to discover the indicators of faith presence as experienced firsthand by the students. Since the students were located in 13 countries around the world, the interviews were conducted through e-mail. The use of open-ended questions enabled the students to openly share their experiences. Approaching class lessons from an Adventist worldview was cited by 8 of the 16 students to have had the greatest impact on their spiritual lives. One student said, The atmosphere shows a real spiritual effect. Even the course material is screened and suitable to uplift God yet showing real scientific evidence (Interviewee No. 2). Another one said, I appreciate that we are being encouraged to stand firm on the fundamental principles of the Seventh-day Adventist Church especially as it relates [sic] to research. Dr. [Professor’s Name] in particular is a man of principle and makes it clear that we must stand by Adventist methods of interpretation (Interviewee No. 8). The next indicator that emerged from 7 of the 16 responses was worship. This refers to the God-focused activity of the class such as devotionals, online chapel, and online week of prayer. One student said, I really appreciated the devotionals for our Hebrew class. Getting deeper into the meaning of the language and the spiritual significance found therein was refreshing for me (Interviewee No. 8). In addition, several students shared their testimonies on the value of the online week of prayer. Both community and discipleship emerged in third place as each was cited by four students. Community refers to the bonding by class members. Citing the impact of online relationships, one student said, I think they are very effective[;] even non-Christians meet a lot and learn about Jesus. I have friends whom I still interact with on other private platforms whom I met online during classes. These friends share a lot of encouragement and strengthening my faith in God and we share a lot when we chat (Interviewee No. 2). Lifestyle was the fifth indicator of faith presence in the students’ responses. Lifestyle refers to experiences that call for the students to practice Christian values and their willingness to express their faith. An example of a response for this indicator was I find that the courses at [Name of School] allow for the expression and integration of my religious beliefs into the coursework. This is my first experience as a student in an Adventist institution and I appreciate being able to freely express my faith in the “classroom” (Interviewee No. 4). 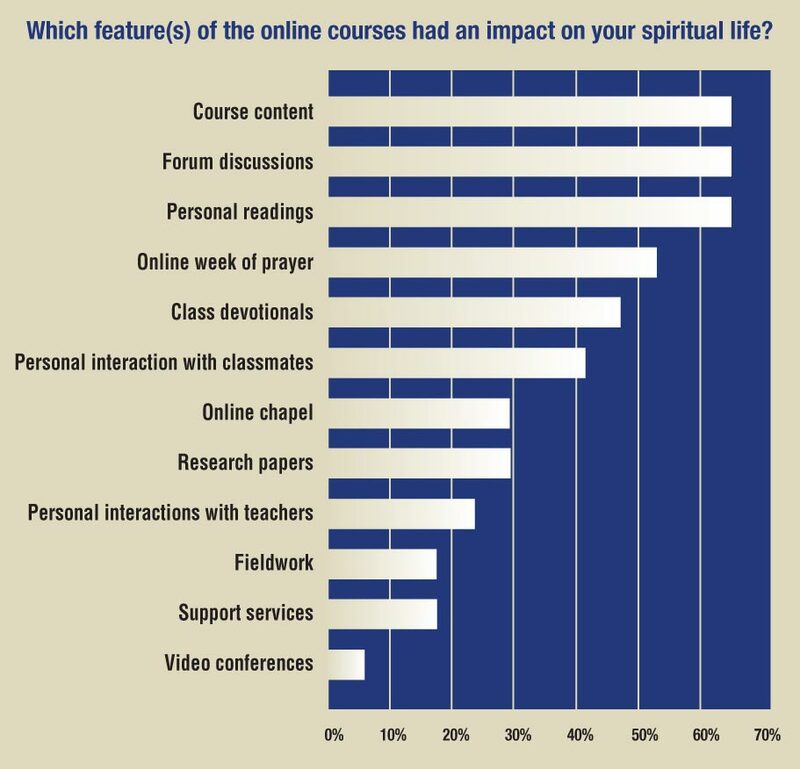 When the interviewers asked which course features had had the greatest impact on students’ spiritual lives, their top choices paralleled the indicators of faith presence (see Figure 2). The course content can reflect an Adventist worldview. The discussion forums can build learning community, clarify a Christian approach to the course topics, and motivate students to live an Adventist lifestyle and engage in mission experiences such as outreach, volunteer service, and other church-related activities. Worship, as an indicator of faith presence, was also confirmed, with the choice of online week of prayer and class devotionals in second and third place, respectively. One student was a bit critical of the spiritual atmosphere of her classes, as shown in her comment, As it is online class, everyone can be hypocritical as you don't know if in reality they practice what they preach. . . . (Interviewee No. 5). She admitted, however, that I have baseline spirituality even prior to my studies. But when asked which course features made an impact on her spiritual life, she readily cited the online chapel, online week of prayer, and personal interactions with classmates. It appears that special worship events and relationships appeal even to students who do not consider themselves to be highly spiritual. Another noticeable result of the survey was the low rank given to teacher interactions. Does this mean teachers have little influence on online students? But a look at the interviewees’ final suggestions to improve faith presence in their classes revealed that many of them simply wished for teachers to be more active in reaching out to students and to enhance teacher presence through video conferences. As one student said, Given that the nature of the online community is somewhat impersonal I suggest that teachers should intentionally find creative ways to be able to bridge and connect with students and give the online learning process a more personal touch (Interviewee No. 6). It was evident from this study that teacher impact was low because teachers did not always take advantage of opportunities for personal connections with their students. To include all the indicators of faith presence in each class will not be easy to accomplish without both the intentionality of IFL on the part of the teachers and the active involvement of the students. This should be reflected in the desired course outcomes, which form the basis for choosing appropriate content presentation, learning activities, and assessments. Below are some ideas on how to accomplish this in an online classroom. Many teachers who teach online classes at Adventist universities normally begin their classes with a devotional that they post on the Web. However, there is no guarantee that students will read these devotions; much less understand them. To encourage engagement with the devotional, teachers can prepare accompanying discussion questions or activities that will require the students to interact with the message and with one another. Further, teachers must strive to make the devotional one of the most exciting sections in each lesson so that students will engage with it without feeling forced to do so. (Read the article “Creative Online Devotionals” on page 35 of this issue). The vast amount of information available on the Web, as well as the wealth of electronic books, resources, and software, makes presentation of course content online easier than in the past. However, since many of these materials are not written by Adventist authors, it can be a challenge to use these materials to present a worldview that supports principles of Adventist education when creating the curriculum. When students read the lessons on their own, they may not easily understand the topics within the context of Adventist beliefs and principles. For this reason, teachers may opt to prepare their own lecture videos to be sure class topics contain the right perspective, but these should be short because lengthy videos are not only difficult to access but also unlikely to hold the students’ attention. Teachers can also include, as a primary resource, a contents page that presents each lesson according to an Adventist worldview, to which other sources can be linked as needed. 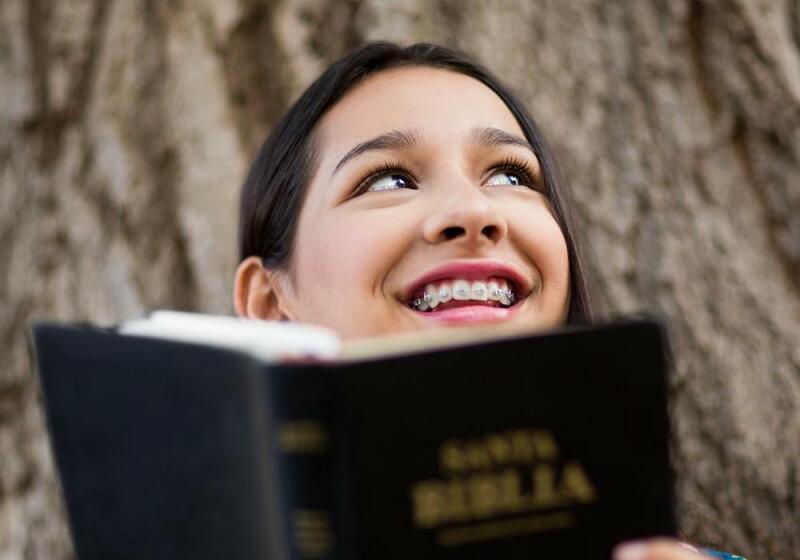 In doing so, teachers can help students understand course content within the context of Christian principles that are hallmarks of Adventist education, like the Great Controversy theme, God’s workings in the physical universe and human history, as well as values such as truth, honesty, caring, and love. Whether students are studying mathematics or chemistry, literature or history, religion or health, when reading the lessons on their own, they can reflect on these principles and apply them to their own lives. Learning activities in an online class are generally organized as forum discussions, assignments, and major projects. The forum discussion, which can be considered the hub of online activities, brings the class to life. This is where learning communities are created, and where faith communities can be formed.13 Through proper facilitation, students can interact with content (thereby gaining an Adventist worldview), with teachers and classmates (strengthening relationships), with self (reflecting on personal applications), with the environment (caring for other people and nature), and, most importantly, with God during devotional forums. The many purposes of the forum underscore the importance of careful preparation of discussion questions and active facilitation by the teacher. Assignments and projects, on the other hand, may be designed to provide opportunities for students to apply what they have learned in service to the church and to reflect, through journals or research papers, on the lesson’s impact on their lifestyle, values, and spiritual life. As Ellen G. White emphasized, “Knowledge is power, but it is power for good only when united with true piety. It must be vitalized by the Spirit of God in order to serve the noblest purposes.” 14 Such assignments and projects help strengthen faith presence in the online classroom. The greatest attraction of online education is that it enables students to access the online classroom at the time and place most convenient for them. Unfortunately, this strength also contributes to a lack of connectedness and challenges regarding personal discipline and time management. (See the article by Anthony Williams et al. on page 22 of this issue.) There is a fine line between flexibility and discipline. But every student must experience godly interactions and dealings from their teachers while they are developing the skills associated with online learning as they seek to reach God’s ideal for them. Every online teacher must understand that the student is the focus of every learning activity—not the instructor, the content, the project, or the class regulations. Faith development is primarily the work of the Holy Spirit.15 Educators merely create an environment in which the Holy Spirit works and where faith can be exercised. To accomplish this goal, teachers and course designers must focus their effort on planning online learning experiences more than they do with their course Webpages. When preparing class lectures, teachers should emphasize thought processes and the worldview from which the topics are presented. When designing learning activities, they need to focus on creating an atmosphere where relationships and the faith community are nourished, Adventist lifestyle is promoted, and engagement in missions is encouraged. Equally important, they must ensure that a devotional activity that calls for active worship is present in every class. These approaches to creating faith presence will help “. . . furnish knowledge as enduring as eternity”16 by nurturing faith development and helping students retain what is most important and of permanent value. Leni T. Casimiro, “Faith Presence: Creating Online Environments That Nurture Faith,” The Journal of Adventist Education 80:1 (January-March 2018): 16-21. Available from https://jae.adventist.org/en/2018.1.4. Arthur F. Holmes, The Idea of a Christian College (Grand Rapids, Mich.: Eerdmans, 1987): 6-8. Community of Inquiry, An Interactive Model (2017): https://coi.athabascau.ca/coi-model/an-interactive-coi-model/. D. Randy Garrison, Terry Anderson, and Walter Archer presented the initial research, and since that time, hundreds of additional studies across multiple disciplines have extended the theory with a bevy of books, published referred articles, instruments, dissertations, and resources. See the seminal paper on this topic: “Critical Inquiry in a Text-based Environment: Computer Conferencing in Higher Education,” The Internet and Higher Education 2:2-3 (Spring 1999): 87-105. For additional resources, see also https://coi.athabascau.ca. Leni T. Casimiro, Effective Online Instructional Design as Perceived by Teachers and Students in Selected Private Colleges and Universities, PhD diss., Adventist International Institute of Advanced Studies, 2009. D. Randy Garrison and T. Anderson, E-learning in the 21st Century (London: RoutledgeFalmer, 2003), 4. Don C. Roy, What Is the Relationship Between Community and Learning? Module 6: “What Is Community? Faith Integration Modules” (2002). Adventist Virtual Learning Network.Retrieved December 28, 2008, from http://avln.org/faith/core6 community.htm. Genesis 2:18, New King James Version (NKJV). Scripture taken from the New King James Version®. Copyright © 1982 by Thomas Nelson. Used by permission. All rights reserved. Peter Berger, as cited in Roy, What Is the Relationship Between Community and Learning? Module 6: “What Is Community? Faith Integration Modules.” Retrieved December 28, 2008, from http://avln.org/faith/core6 community.htm. Ellen G. White, True Education (Nampa, Idaho: Pacific Press Pub. Assn., 2000), 11. Don C. Roy and Shirley Freed, “Creating Learning Communities in Online Classrooms,” The Journal of Adventist Education 65:4 (April/May 2003): 17-19. John Wesley Taylor V, “Thinking Christianly About Adventist Education.” In Warren A. Shipton, Elainie Coetzee, and Raddeep Takeuchi, eds., Worldviews and Christian Education (Singapore: Trafford Publishing, 2013), 427. Damon Osborne, “Fostering Online Communities of Faith” (Chapter 14). In HeeKap Lee, Faith-based Education That Constructs: A Creative Dialogue Between Constructivism and Faith-based Education (Eugene, Ore.: Wipf & Stock, 2010). Ellen G. White, Counsels to Parents, Teachers, and Students (Mountain View, Calif.: Pacific Press, 1943), 38. Gerald D. Bridges, Growing Your Faith: How to Mature in Christ (Carol Stream, Illinois: NavPress, 2004), 49. Ellen G. White, Fundamentals of Christian Education (Nashville, Tenn.: Southern Publishing, 1923), 192.